Based in Derry/Londonderry, we offer a wide range of legal, notary public and property related services. The firm was established in 1992 and is maintained by partners Greg McCartney and Kevin Casey. We provide a wide range of quality legal services including residential and commercial conveyancing, Wills and Probate, accident litigation, children's welfare and matrimonial, court representation in criminal cases and a free 24 hour call out service to clients detained at police stations. Our Solicitors have over 50 years experience between them in providing a general quality legal service to the people of Derry and beyond. Legal aid is available for many of the services we offer. 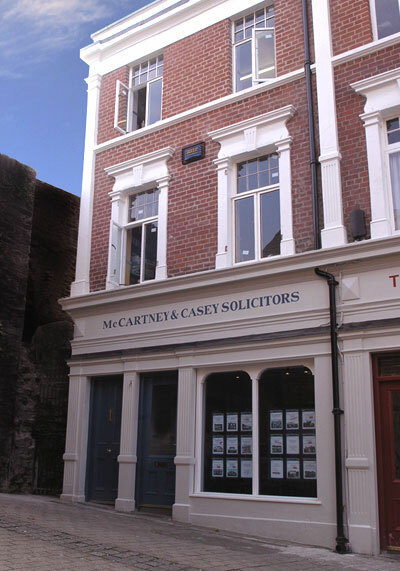 McCartney & Casey is unique in Northern Ireland in that it provides a full range of estate agency and property services through its Solicitors Property Services division. Financial Advice on Mortgages, Insurance and Pensions is available through introduction to a locally based Independent Financial Adviser. McCartney & Casey are also now registered to practice throughout Ireland.